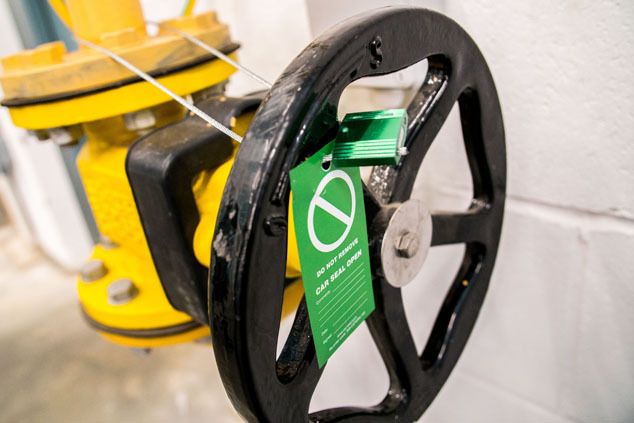 Occasionally process and operations personnel tell us they’re intending to use car seals for locking valves instead of Lockout Tagout (LOTO) systems as part of a cost reduction program. Such practices are fraught with danger when cost is a driving factor in managing procedural and operational safety. This is fundamentally wrong and a violation of OSHA (CFR) Part 1910.147 guidelines on The Control of Hazardous Energy. Car Seals and Lockout Tagout are not competing technologies and therefore shouldn’t be considered as alternatives to perform the same task. This critical feature can be hard to communicate when, on a practical functional level they do indeed perform the same task. They both lock a valve to prevent its operation. Instead, the two systems should be viewed in the context of procedural control rather than pieces of hardware. Because the Car Seal has to be destroyed to remove it, it tends to be used for locking off valves on long-term isolations. Nothing wrong with this. But compare this to the core reason for using a Lockout Tagout process. To protect workers engaged in maintenance activities and safeguard them against the unexpected release of hazardous energy. A car seal simply cannot perform this task. The LOTO hardware (padlock and tag) performs the role not only of a mechanical lock but also a communication system. The process will use a colour coded padlock as the first stage communication. The colour of the padlock can indicate, for example, the engineering discipline of the worker e.g. Electrical, mechanical etc. Or maybe the type of stored energy prevailing e.g. High voltage, steam, gas etc. The tag will add a further layer of communication integrity for example, who is carrying out the task, the nature of the task, when the task commenced and when it’s likely to be completed. And most importantly, because of the integrity of the padlocks in use, only the person who placed the padlock can remove it. This requirement is referenced in sub-section (e)(3) of the OSHA 1910.147 standard wherein it states “Each lockout or tagout device shall be removed from each energy isolating device by the employee who applied the device.” This requirement cannot be met with a car seal. Having said that, the Car Seal system can include some of these features by using colored seals and tags, but unlike a LOTO system which uses keyed padlocks, car seals can be easily removed with cable cutters. And this small point of detail is at the core of the safety integrity which cannot be achieved by car seals alone. All this paints a bleak picture for the humble car seal. But we must not totally diminish the role of the car seal in process safety. It certainly has its place in the work place and can provide a layer of safety integrity, traceability and audit. When used to the fullest extent of its intended purpose the car seal will protect safety critical valves against inadvertent or accidental operation. When used as part of a car seal program it can provide a full inventory of valves in service, indicate the safe operational status of the valve and provide safe guidance when the time comes to remove the seal to operate the valve. The OSHA Directive CPL 03-00-004 “Petroleum Refinery Process Safety Management National Emphasis Program” gives guidance on the use of car seals on the upstream and downstream isolating block valves of a safety relief valve, but stresses the importance of having control measures and safeguards in place to guide workers on there us. In summary, a lockout and car seal perform the same mechanical use (locking a valve), but the procedures and control measures in which they are used are very different. Making the wrong product selection can put lives at risk. Car Seal Programs and how they operate. Car Seal Program and Relief Valves. For further guidance on the use of car seals and lockout tagout programs, contact Total Lockout today. What does Car Seal Open, Car Seal Closed mean? Why are there different coloured car seals?